A special Thank you to Puffin Books for sending me this book to review! 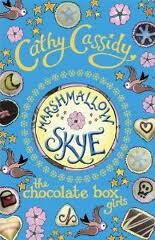 Skye wants to be her own person, but with an effortlessly cool twin, how can she? Will Skye ever step out of Summer’s shadow and find her own chance to shine? This is seriously such a cute book! The cover alone is gorgeous! How could you not want to read this book?! This is the 2nd installment in the series, and it is just as good (if not better) than Cherry Crush! Marshmallow Skye has a spooky feel to it too, which is perfect so close to Halloween. Skye is an identical twin and is really searching out who she is apart from her sister. She hears a spooky ghost story on Halloween night and then her mother find a trunk full of old things belonging to the girl in the ghost story. Spooked yet?! Skye starts having dreams and everything goes out of control. I love the Tanberry Bed and Breakfast and I love love love that old Gypsy Caravan! I want one! Now! Not to mention all of Paddy's homemade chocolates. I could actually smell marshmallow in the air. Taste that sweet stick fluffy treat on my tongue. The descriptions are great. I need s'mores. Now. This series has much more to tell. There are 3 more sisters stories, and I wish I had the books now! This will make a perfect book for a niece or daughter just around this Halloween season! I loved it! "I don't believe in ghosts," Summer says firmly. " I'm not crazy! But, I'm telling you, there is something weird about all this stuff. It makes me uneasy."